Our shoulder, hiding under the hay. Jessie we got you in 2006 from a petshop which is why we're unsure of your birthday, which was a year of heartache for us, it saw us lose our 2 dogs in January 5 days apart, my Mother in August, 12 days later our 7 year old rabbit, in September my husband's Father and 18 days later one of our guinea pigs. 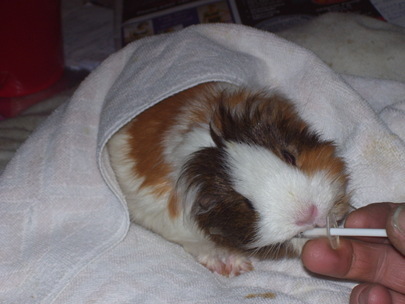 You were the only bright spark of that year, for the first 3 years of your life they were uneventful, you grew and ate and pooped what guinea pigs do. But just after your third birthday you started to eat less and lose weight. You had X-rays, the vet would put you under and check your mouth but nothing was found. So we continued on but we as your owners knew something was wrong, our vet was certain it had to do with your girlie parts, we on the other hand were certain it had to do with your teeth. 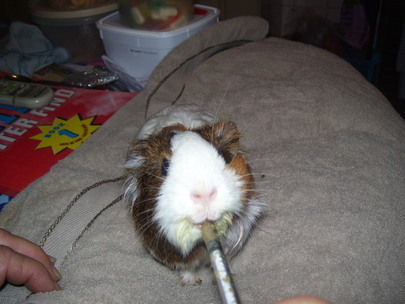 Sadly we proved to be right you devloped an abscess which was marsuplised but once that was healed another would form. 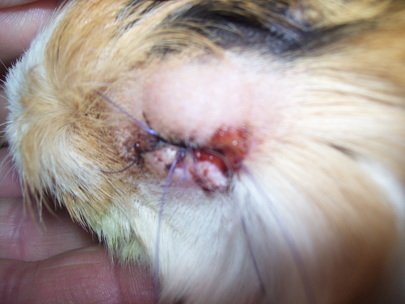 You would get 4 abscesses in 7 months the cause was never sought by the vet just the abscess treated. 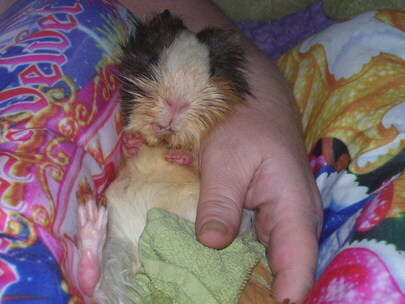 So we were referred to another vet who had a better dental machine and it was found you had a very bad tooth and a lot of swelling, they gave us 3 options to have you PTS, to have the tooth removed which they gave you 10% suriving the surgery or taking you home and allowing you to die. You have NEVER given up so we were not giving up on you we opted for the surgery and like a little trooper you survived it. I always remember you had only just woken up from an 1 hour surgery, they bought you into see us, I said to you "Hello sweetheart" you lifted your groggy head and very groggily you walked over to me and laid down beside me. That little gesture bought tears to my eyes and still does when I think of it. You stayed at the vets overnight then we took you home, you started to eat soft food and we felt so proud but them we noticed your mouth was becoming misaligned and you were having trouble eating by yourself. The vets accussed us of breaking your jaw but X-rays 4 months later showed where the tooth was removed other teeth had moved to cover the vacant spot causing your mouth to become misaligned. Of course we had been syringe feeding you four hourly for 6 months so we just continued. So for the next 4 and a half years we continued to syringe feed you every 4 hours 7 days a week and we enjoyed it as much as you did. Every 4 weeks after the tooth was removed you would go to the vet and have your teeth filed-going under each time, every 2 weeks after that you would have your incisor teeth filed fully awake. You took this all in your stride never giving up. You attacked life with gusto and you held onto life with gusto. 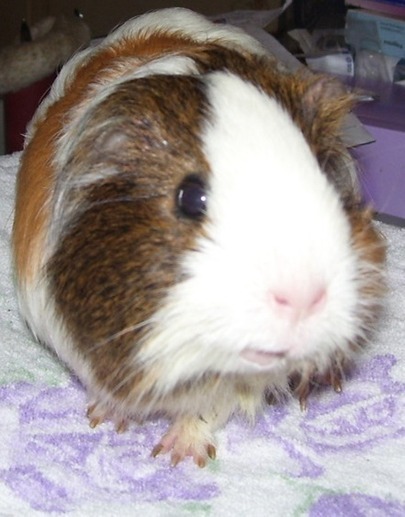 You taught our vet so much about guinea pigs and their teeth so much so she would only use enough gas to knock you out, do your teeth and if you woke before she had finished would give you some more gas. NEVER any surgery chemicals and everytime you would wake up fast and dive for your food, getting it all over you. Every year your birthday came we thanked God for you, then on December 1st you had your teeth done but you seemed different, I put you onto AB's(My fault sorry I killed you baby)but this had no effect, so I took you to the vet who thought it might be your kidneys and said off with the AB's. But you went down hill so silly me put you back onto the AB's on the Saturday you got a Sub Q and picked up but by the Sunday you were flat again. I still blame myself for giving her the AB's I thought it was just an infection like she had many times before, after a teeth filling where water would sometimes enter the nostrils causing an infection, I had no idea I was killing her kidneys or putting the last knife into them. 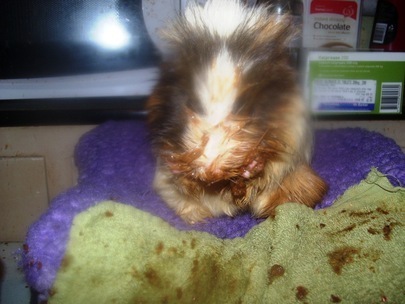 I am so sorry I failed you our sweet trusting angel. 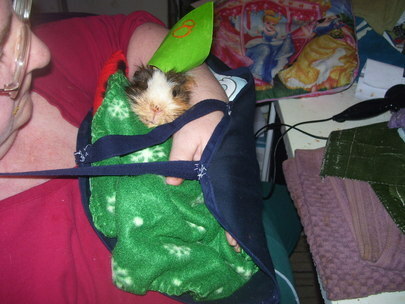 On the Monday we took you back to the vet for another Sub Q BUT it was clear you did not have much time left with us, so I held you, talking to you, crying with you. Then on Monday December 15 at 7.20pm Sth Aust time you slipped away in my arms. Leaving your Father and me so lost, shattered and devasted without you. We always knew you could not live forever but you had survived so much, been with us through so much we always thought you would be with us. 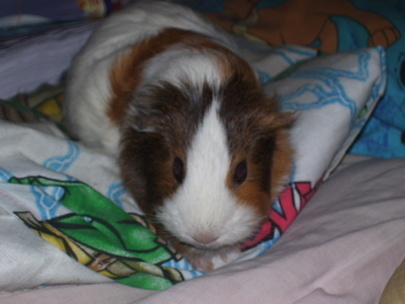 People would laugh at us for spending so much on a guinea pig-your treatment cost us over $30,000.00 but that was a drop in the bucket compared to the love you gave us. You taught me to love again and to trust and no matter how small you are you can conquer anything. Jessie our darling you took us on an amazing journey and taught us so much, we were always together and shared the highs and the lows. You captured our hearts and so many people's hearts around the world with your story of courage and hope. You will never be forgotten, there's a hole in our hearts that will never be filled. Sadly our darling this was one journey the final one you had to make alone. Until we meet again our brave little angel. RIP Baby you earned it. Till we meet again. 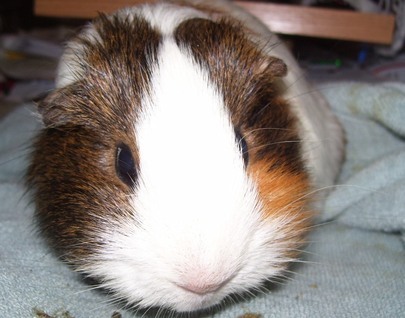 Some may say we should have had her PTS but a guinea pig having teeth done every 4 weeks should NOT live longer than 6-12 months as the gas affects the kidneys, a piggy being syringe fed again lives no longer than 3-6 months BUT Jessie lived for 5 years, that was her fighting spirit, we NEVER forced her, she had a will to live!